The German-engineered LAMPERT SM03 comes equipped with a certified LCD welder's eye protection system that was specifically developed to protect your eyes from radiation during welding or in the event of a malfunction. The filter on the SM03 darkens automatically and ranges from DIN 3 at its brightest, to DIN 11 at its darkest. At all times, your eyes are shielded from danger--but the filter is never so dark that it causes unnecessary eye strain. The SM03 was developed not only with safety but also comfort in mind. The adjustable height and ergonomic hand rests also work to make long welding sessions relaxed and comfortable, and the extra LEDs in the handpiece retaining arm provide optimum illumination of the working area. As with all LAMPERT products, the SM03 is built to last forever: LAMPERT designs its welding microscopes with a fixed 10X magnification and large 20 millimeter diameter field of view so that as few mechanical components or functions as possible can be damaged by the vibrations that can occur during welding. LAMPERT products are protected by the manufacturer's three-year warranty. 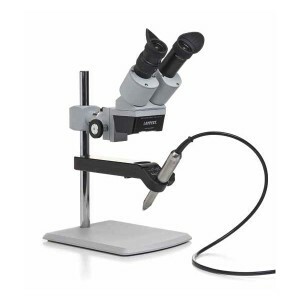 Lampert® SM03 Welding Microscope 0.0 out of 1 5 based on 0 ratings. 0 user reviews.